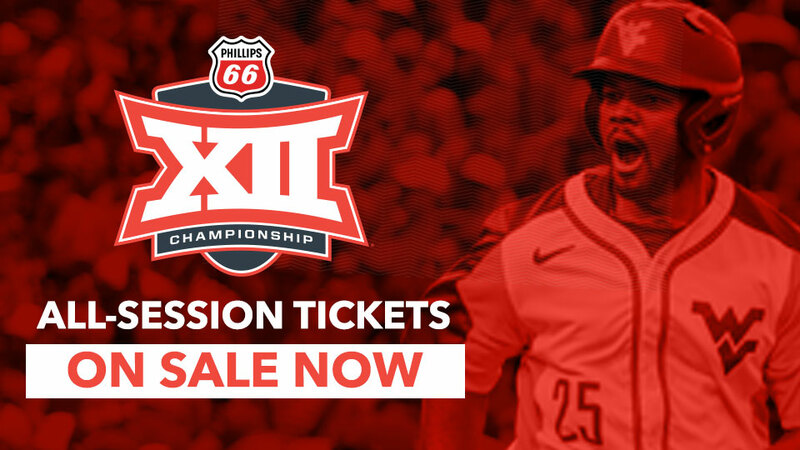 OKLAHOMA CITY - All-session tickets for the 2019 Phillips 66 Big 12 Baseball Championship at Chickasaw Bricktown Ballpark are now on sale. The championship will be played in a double-elimination format beginning Wednesday, May 22 and culminate with the championship game Sunday, May 26. All-session tickets can be purchased by visiting Big12Sports.com/BuyTickets and include all games of the championship, including if-necessary games, totaling 15 contests. Tickets start as low as $69 for terrace seats, with field level seats at $99 and club seats available for $169. Tickets can also be purchased online here or by calling (405) 218-2180. The event will consist of two four-team brackets with the first game slated for 9 a.m. Central time May 22 and the championship game May 26 at 1 p.m. Central time. The eight teams with the best conference records - based on winning percentage - in regular-season competition will qualify. The Oklahoma City Convention and Visitors Bureau and the Oklahoma City Dodgers will serve as the championship hosts for the 20th time at Chickasaw Bricktown Ballpark, located in the heart of Oklahoma City and the vibrant Bricktown entertainment district.